Vine Valley Farms Inc. is a family-owned, third-generation farm that rests in west central Minnesota. In 1947, the farm established its roots in the rural area of Stewart as a traditional farm with a focus on livestock, grains, and other legumes. As time progressed, the experimentation with pumpkins and winter squash planted the seed for the expansion of other vegetable commodities. Over the years, the company has diversified its production to a wide variety of vegetables, including zucchini, cucumbers, green beans, cabbage, peppers, onions, red beets, and winter squash. Corn and soybeans are other crops that are also raised, as they play an important role in crop rotation. 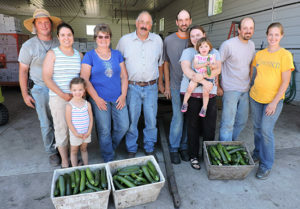 Today, the family-farm is owned and operated John & Wendy Tanata and their sons Josh, Adam, and Anthony. Each of their sons devote their time into their individual areas of expertise and areas of study in college: agronomy, horticulture, and marketing. John & Wendy are also greatly involved by managing the other aspects of business and making sure the operation runs smoothly. One of the key factors that makes Vine Valley Farms a successful company is the land’s rich loamy soil. This type of soil is rich in nutrients and is able to hold in the moisture that mother nature is able to bring, even during the dry years. The family plays an active role in soil conservation and stewardship with the use of sustainable farming techniques such as annual crop rotation, cover crops, field cultivation, and integrated pest management. Even though the soil is a key success to their operation, mother nature is sometimes one of the biggest challenges they face when it comes to weather, moisture, and pests. In recent years, the lack of bees worldwide has also been a concern for the family; without bees, the plants are not able to produce the vegetables they sell. The Tanata’s focus their time in producing quality produce and delivering fresh product to the consumer. When supplying locally grown produce to its customers, freshness is achieved by practicing just-in-time inventory management and reducing transportation time, which is very important aspect when it comes to quality. Within recent years, the Tanata’s developed their own brand name, Gems of the Valley, which blossomed from the idea of packing and marketing their own homegrown onions in prepackaged bags. With this advancement, the family is able to maintain quality and freshness while reducing the involvement of the middleman and age of the product. Today, Gems of the Valley is promoted on all of Vine Valley’s products. One of the most important elements when it comes to quality is implementing and practicing food safety procedures. Vine Valley Farms goes through annual inspections with USDA with Good Agricultural Practices (GAP) and Good Handling Practices (GHP). The Tanata’s train each and every employee with these practices to meet and exceed these regulations in order to protect the consumers well being.